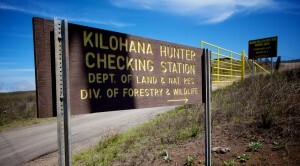 Army officials are opening the Keamuku Maneuver Area (KMA) for bow hunting, here, August 22-23, from 5 a.m. to 7 p.m. KMA will be open for bow hunting of mammals only. The bag limit is one pig and one goat per hunter, per day. Army officials are opening several training areas for hunting, here, April 11-12, from 5 a.m. to 7 p.m. Training areas 9, 12-16, and the unfenced portion of training area 18, will be open for bow hunting of mammals only. Army officials are opening the Keamuku Training Area for bow hunting, here, June 21-22, from 5 a.m. to 7 p.m. Keamuku will be open for bow hunting of goats only. Hunting of sheep or pigs is not permitted there this weekend.